You may have seen this statement used somewhere before as a motivational quote. The idea being something like living with courage and individuality. It means something quite different to us. We’re offering it to you as instructions for how to grocery shop for your optimal fertility diet. What’s your first thought when you go to the grocery store? Remind yourself of the following from now on. They put all the fresh food around the outer perimeter of the store. This is where there’s electricity to power coolers and freezers to keep food fresh. There’s very little “food” in the inner aisles. Think of them as science experiments you’d rather not be the guinea pig for. The average “expiry date” for these foods is somewhere in the next century. When my kids were little, I used to say to them, “Always eat as close to God as possible, the way nature intended.” Imagine how your great-grandparents would have eaten. What was their relationship to food? For starters, they had no access to processed, chemically-laden foods. The only preservatives were the traditional methods of fermenting or pickling. Their generation did not suffer from our epidemic level of chronic health issues. Eczema, allergies, and asthma were rare. Food was still food. There were no labels to read and their grocery stores were MUCH smaller. They ate to live, they didn’t live to eat! The outer perimeter of your grocery store is a good source of healthy food. But there’s an even better option. That is, getting your produce and meats at your local farmers’ market. There, you have the opportunity to develop a personal relationship with your farmer. You can learn about their approach to farming, and know where your food comes from. You may even get the chance to visit their farm, and see its operation for yourself. The life energy contained in local food begins with the human care that goes into producing it. It hasn’t travelled on the back of a truck for many days on end. It’s about as direct a relationship you can get from farm to plate. Freshness and nutrient density are still at their peak. We live in the age of food labels, so it’s critical to learn how to read them. A walk through your grocery store feels like an advanced chemistry class. Research the different names for common additives, preservatives, and flavor enhancers. MSG, for example, is an unhealthy additive that hides behind a bunch of different names. Also, beware of sweeteners of all kinds – they’re in everything! HFCS (High Fructose Corn Syrup) has many alternative names to watch out for. ‘Crystalline fructose’, or ‘glucose-fructose’ are two examples. Most packaged food has some kind of modified or artificial sweetener. Find out the names of the most common ones, and their derivatives. Start with the big ones, like ‘sucralose’, ‘maltitol’, and ‘maltodextrin’. You’ll soon become like a seasoned bouncer rejecting teenagers with fake ID. The more conscious food consumers are, the more clever marketers have had to become. They are always trying to outsmart you. They’ll change the names of bad ingredients to be healthier sounding. Bring a running list of your ingredient research notes to the grocery store, to know what to avoid buying. Try to make this a fun task for yourself. Pretend you’re playing a hilarious new board game called “Sneaky Synonyms”. The grand prize is your own health. 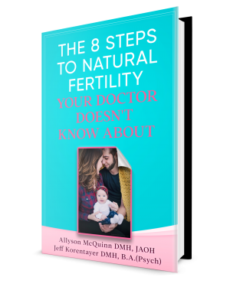 This topic is further expanded in Step 2 of The 8 Steps to Natural Fertility Your Doctor Doesn’t Know About. You can download your free copy here. I hope you are well and enjoying your summer. I’m spending more and more time again on your site because I am doing a mild, short detox and building a long-term Principled Detox (resonated with that post) as part of my goal of a more integrated regimen … reading this post I am amused and frustrated in the local grocery stores and find so much “healthy” junk food in the “health food” section … probably the reason I started learning and making my own. I now make great Kale Chips and use Papaya Seeds as a pepper substitute!